Unpredicted hurdles in dealing with integration, variability, and interoperability in software development can be overcome via higher-order process engineering. Even in its simplicity-oriented, tamed form, this approach fosters a powerful _plug&play discipline, where processes and services are created, stored, passed, and moved around like data. The following illustrations show how the higher-order feature works by describing the execution of a higher-order process. The process is situated in the Chainreaction domain. The green arrows depict the control-flow of the execution, blue arcs represent a read operation (data-flow), as well as orange connections write operations. The pictures are separated into two parts denoting the control-flow (lower part) and the data variables (upper part), respectively. Fig. 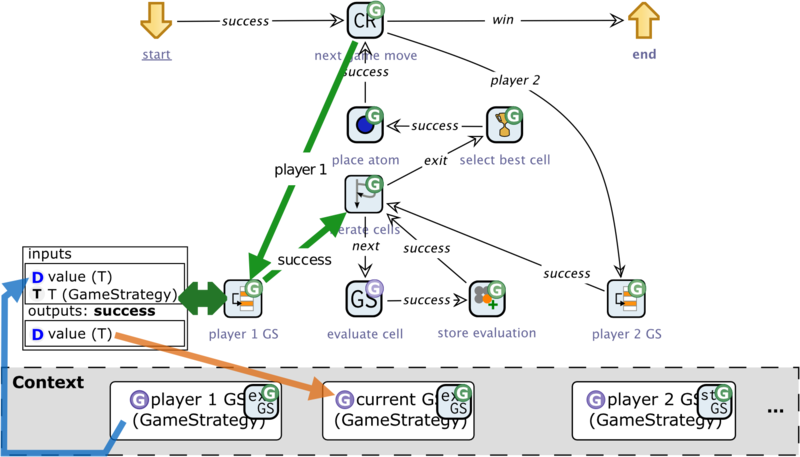 1 introduces a simple process, which creates two game strategies (realized as process models themselves) for the game Chainreaction and stores them to the execution context. 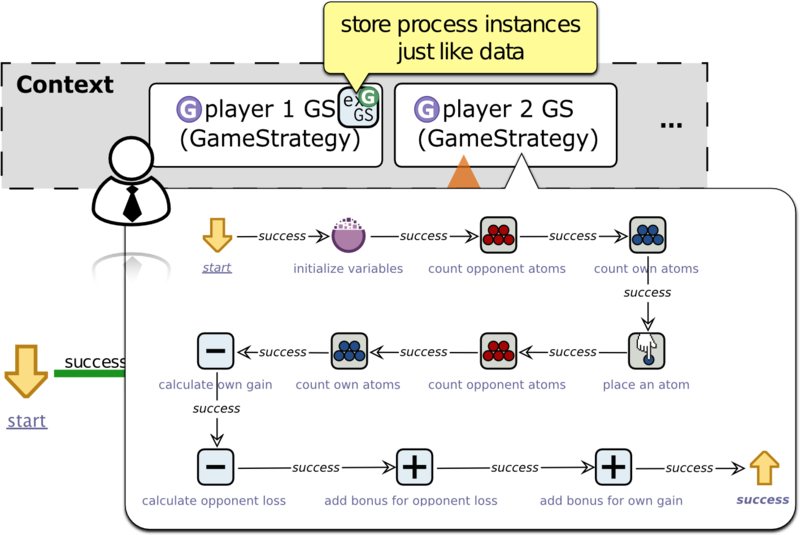 Afterwards the process starts a game where both game strategy process instances are passed just like data as higher-order parameters and compete (see activity start game). Each game strategy evaluates the benefit of making a specific game move and returns it as an integer. The execution environment (encapsulated by the activity start game) is responsible for choosing the best rated move and handling the interaction with the game. In the first image the beginning of the process execution is depicted. 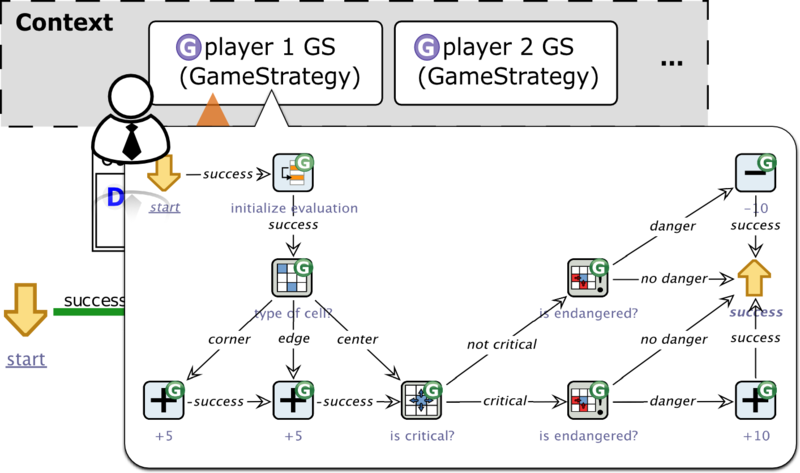 Currently, the constructor activity labeled ExampleGS has been executed, i.e., it has created a new process instance of the game strategy ExampleGS and stores it to the context variable player 1 GS. Fig. 2 shows that the process instance stored to the context variable is a concrete game strategy implementation. It implements the graph interface GameStrategy, which ensures compatibility between all game strategies. 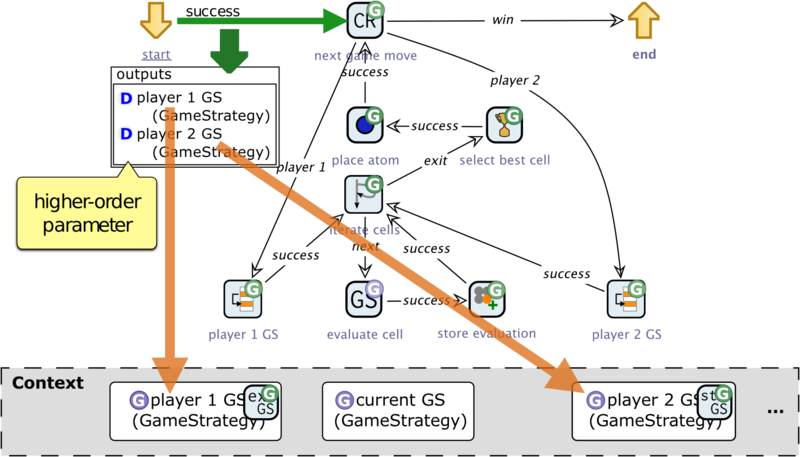 the situation after executing constructor activity Standard GS which creates a new process instance of a second game strategy implementation process. The process instance is stored into the context variable player 2 GS. A bonus of 1 is added for each atom that the player has gained by doing the respective move. A bonus of 1 is added for each atom that the oponent looses when the player does the corresponding move. 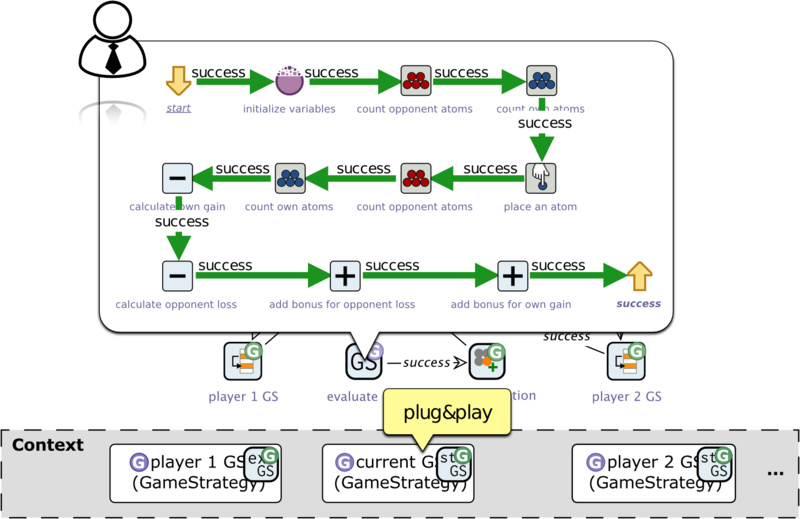 The activity start game receives two game strategies as input parameters. Fig. 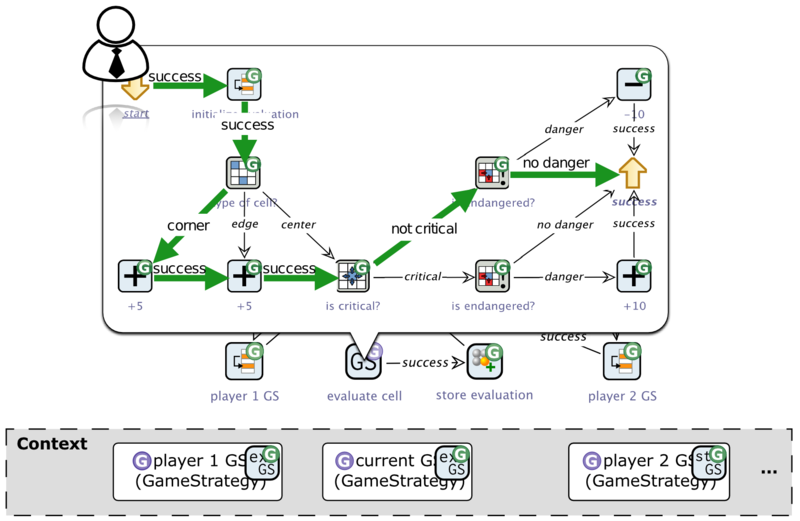 5 shows that the game strategy process instances stored earlier (depicted via the icons labeled exGS and stGS in the context variables) are passed to the activity as parameters. This is where the actual process passing takes place as actual parameters to the subprocess represented by the activity start game. Hence, process instances are treated as first-class citizens. Now the execution dives one hierarchy level deeper into the sub process beneath the activity start game. The respective sub process is shown in Fig. 6. At first, the formal input parameters are evaluated, i.e., at runtime the passed arguments from one hierarchy level above (i.e. the process from the images Fig.1 – Fig. 5) are stored to context variables. 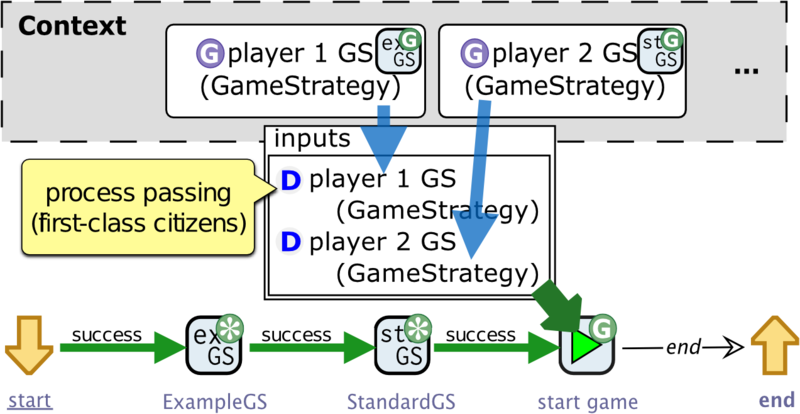 In this example execution the Example GS from the input parameter player 1 GS is stored to context variable with the same name player 1 GS the Standard GS analoguously via input parameter player 2 GS to the equally named context variable. The process manages the game turns where the players do their moves alternatingly until a winner is found. If it is the first player’s turn (see Fig. 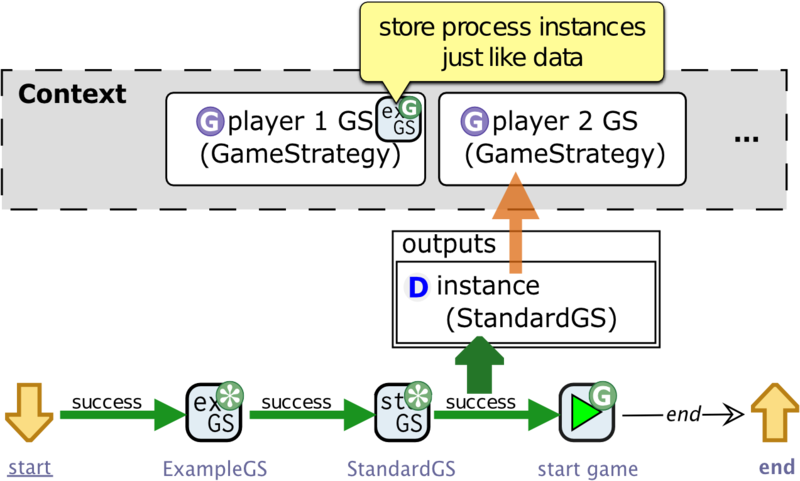 7), the activity player 1 GS takes the game strategy process instance stored in the respective context variable and stores it to the context variable current GS. This is currently the game strategy ExampleGS of the first player. The context variable current GS now holds a reference to the corresponding process instance highlighted via the small icon exGS. For each player’s turn the process iterates through the cells of the board (activity iterate cells). 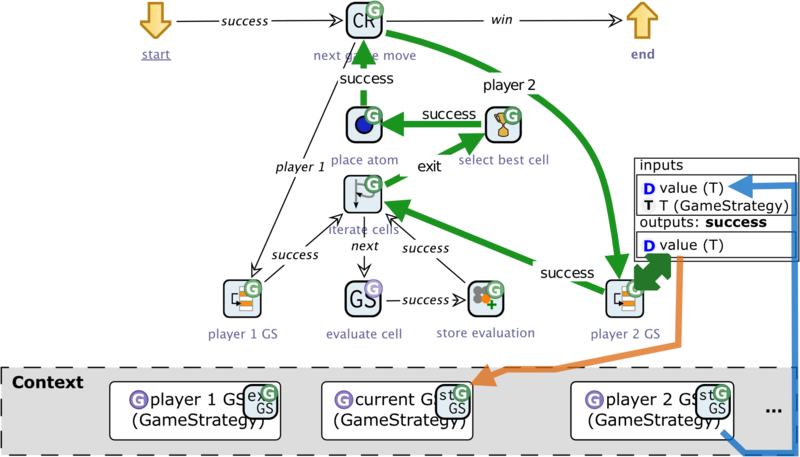 In each loop iteration the process instance of the current game strategy (read from the context variable current GS) is executed as shown in Fig. 8. For the first player this is the game strategy ExampleGS. Hence, the activity evaluate cell uses the process instance currently stored in context variable current GS and executes it in a plug&play manner. Compatibility is guaranteed via the common graph interface GameStrategy. the next move is initiated and its the turn of player 2 now. 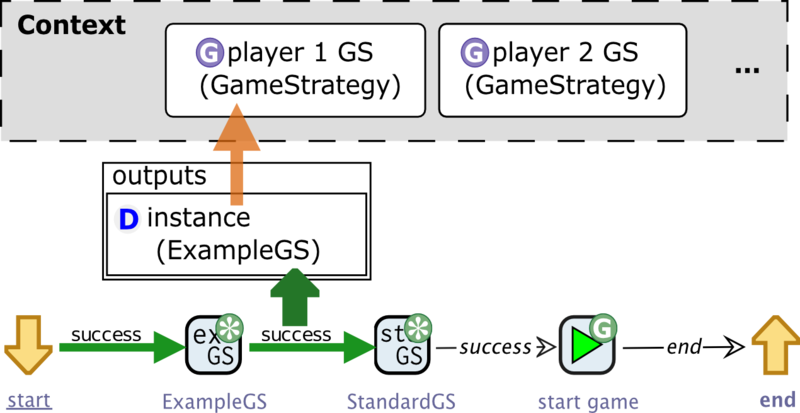 For the second player, the respective game strategy process instance Standard GS — stored in context variable player 2 GS — has been put to context variable current GS replacing the game strategy from the first player. The (technical) key to our approach is the introduction of type-safe stacked second-order execution contexts (see below) that allow for higher-order process modeling. Tamed by our underlying strict service-oriented notion of abstraction, this approach is tailored also to be used by application experts with little technical knowledge: users can select, modify, construct and then pass (component) processes during process execution as if they were data. We base on the eXtreme Model-Driven Design (XMDD) paradigm and its incarnation the jABC3 which allows for complex hierarchical graph structures by means of business activities that represents a complete sub-graph. Newly, in our enhancements to XMDD (subsumed by HOPE), we support complete processes as first class objects in the (execution) context of a process leading to second-order process modeling. The main technical idea is to allow virtual process model calls in form of business activities representing sub-models, introducing polymorphic executable process models. This is realized by considering process model instances, denoted by process instance, as first-class objects and therefore introducing a second-order context for exchange between the sub-graphs of a service graph. For higher-order modeling, we go one step further towards higher-order functions known from functional programming, as a process instance may have a context with further process instances and so forth. This is realized via a local context for every hierarchy level, that is implicitly stacked. Hence, our context is still second-order. Furthermore we offer activities for the creation of new process instances denoted by constructor activity. Hence, we go one step further to a tamed variant of higher-order process modeling, which avoids many of the well-known problems of full higher-order as it is based on a very strong notion of type correctness (cf. ). Sub-process instances may be used as input and output parameters of a process — called Service Logic Graphs (SLG) — and also be stored in the execution context of every hierarchy level. The actual parameters of a graph type are process instances with its own runtime execution context, which is second-order. Hence, we slice our higher-order models into second-order contexts, which are stacked implicitly. This results in a ‘tamed’ notion of higher-order which allows us to statically type every parameter and context variable. documenting service and interface graphs and their input and output parameters in a similar fashion as, e.g. Javadoc for Java. The documentation is presented in the GUI of the development environment jABC as tooltips in order to ease communication between the modeler of different hierarchy and therefore abstraction levels. The interface and service graphs are organized in SLG libraries and are published to an application expert for use without any knowledge about the details of the underlying structure. This may even be used for communication of requirements, as an application expert may, e.g., model and document a dummy service or interface graph, that is then implemented by someone else. The realization of the hierarchy levels can be done separately, by different responsible people or groups. Every graph (interface and service graphs) may be equipped with an icon (e.g. a raster or vector graphic) which is used for its representation as it is used as a business activity. This eases the understanding of a model with a lot of sub-processes and serves as a recognition feature that appeared to be very effective in cooperation with industrial partners. the level of abstraction can be changed by choosing implementations that operate on different layers of a multi-layered application like, e.g., the presentation layer and the business logic layer. A business activity representing a service or interface graph SIB is denoted by interface graph SIB resp. service graph SIB, or graph SIB if any of both is meant. In general, their interface description consists of a list of inputs, the origin of the process instance, a list of outputs for each outgoing branch, and a reference to its interface or service graph. Process instances as well as outputs are read from resp. written to the context. The corresponding values are represented by context variables at runtime. A process instance may be initialized and put to the context in the graph itself (via constructor SIBs) or before the process has been started. Input parameters may be provided statically for primitive types as well as a selection of Java types supported by the jABC, e.g., strings, enumerations, and file handles. That means that a modeler can design new SLGs and decide which input values are statically entered and which are retrieved from shared resources on-the-fly at modeling-time.